Brian Fisher Print, Paint and Assemblage Blog: Born to Print, Monotype Workshop! Born to Print, Monotype Workshop! Good friend and art compatriot, Ilse Reimnitz and I share the billboard in a couple upcoming shows. (Corvadie Press’s “Printmakers Hand III” and “B2 Gallery Fall Exhibit” in September-November). In mid August we also taught a Monotype workshop at Ilse’s gorgeous print/paint studio. 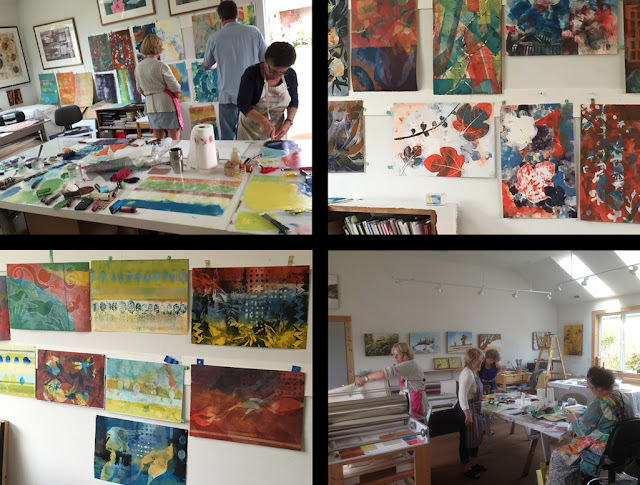 We’re equally passionate about print process and in this class we felt particularly well matched with six print curious artists that were so obviously born to print! Here are just a few images from a wonderful weekend!